Beautiful funk. Sigh. The Grayson is lovely in its dank stinky creaminess. Add this beer and it is a fruity, slightly boozy, funky mouth party. The perfect end to an amazing meal. 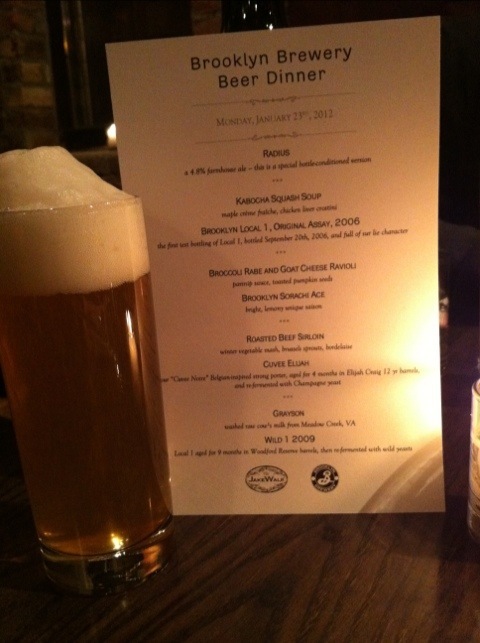 The deets: Brooklyn Brewery Brewmaster Garrett Oliver narrated the event & he did an amazing job, as usual. He is one of the best speakers in the craft beer biz & tonight was no exception. His passion & knowledge were the perfect compliment to an amazing culinary experience. The beer & food were delightful. And at $45 per person, quite a value. 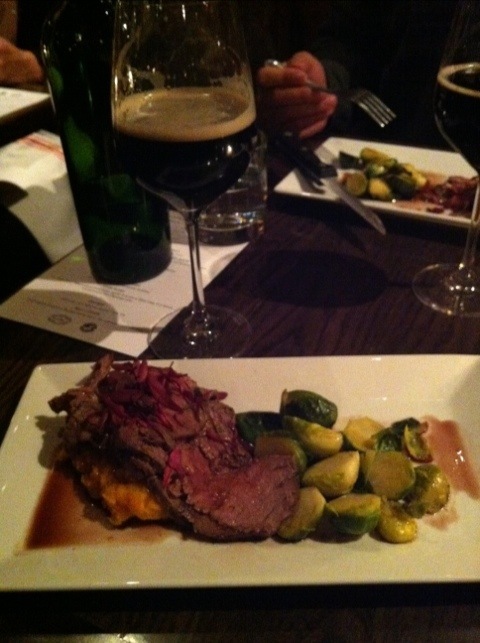 If The Jakewalk does more beer dinners, make your reservations – you will not regret! Ah, comfort food. I mean that in the best way possible. The earthiness of the brussel sprouts, the sweetness of the mash & the salty-sweet richness of the sirloin with bordelaise equals the home-cooked meals of my Midwestern youth done right (sorry, Mom). This beer is the vanilla-coconut-boozy background to a perfect rainy winter night dish. I’ll readily admit that it has taken me a couple of years to warm up to Sorachi Ace hops. I found them a bit too harsh in their lemony woodiness. They reminded me of Lemon Pledge, to be honest. But warm up to them I have and Brooklyn’s Sorachi Ace is a wonderful showcase to this unique hop. And it is now available year-round. 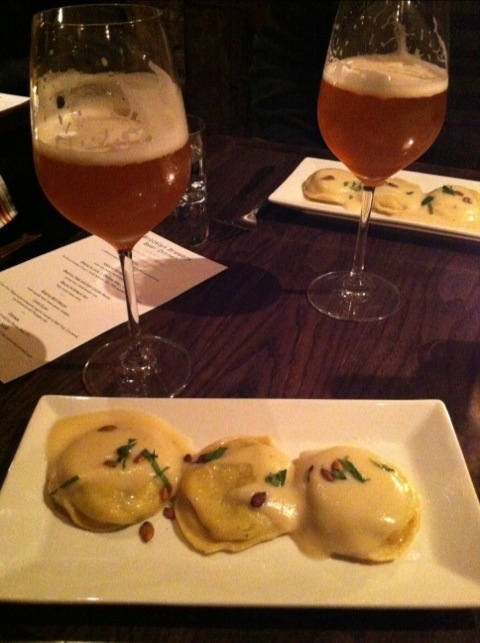 The pairing – the beer is a bright contrast to the rather delicate nature of the ravioli. There is bitterness from the broccoli rabe & the parsnip sauce is creamy but not overwhelmingly rich and the pumpkin seeds are contrasting in their nutty earthiness. The Sorachi Ace is the lemon spritz to this dish. Yum. 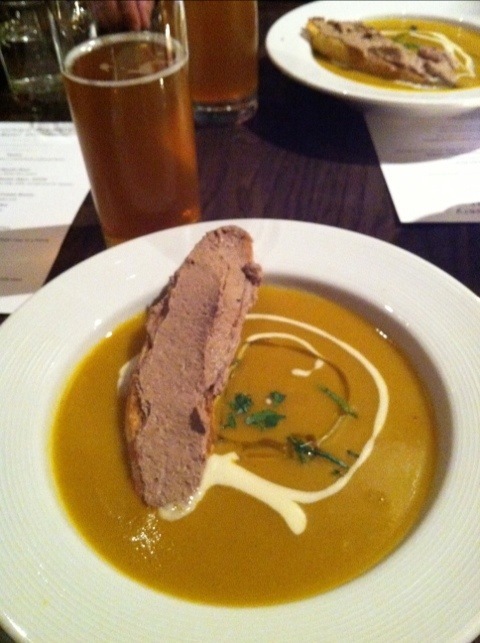 Kabocha Squash Soup, maple creme fraiche, chicken liver crostini paired with the Brooklyn Local 1, Original Assay, 2006. This is one delightfully rich dish – the nutty, earthiness of the soup and the fatty decadence of the chicken liver crostini. 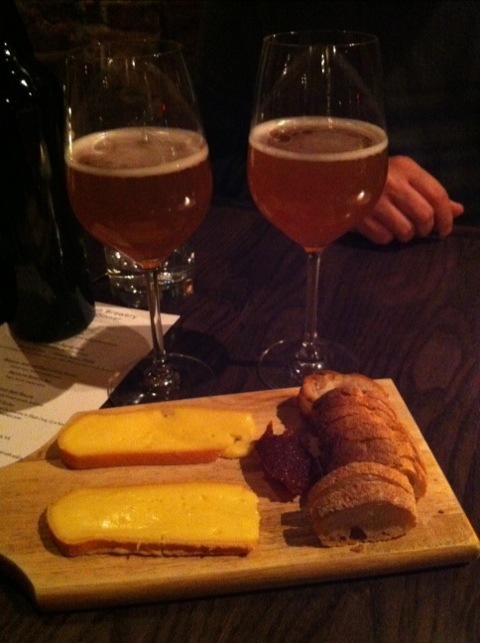 This beer is a nice pairing – the fruit & leather flavors compliment and the high carbonation cuts through the fat. Scrumptious! We’re starting off with the Radius, a beer that is available only on draft only in Brooklyn. This 4.8% farmhouse ale is delightfully drinkable. Don’t let the low ABV fool you – this is a complex ale with notes of lemon, white pepper, and fresh pear. Lovely!